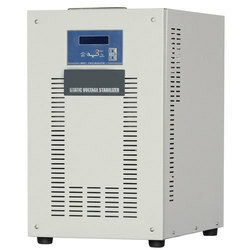 Manufacturer & Supplier of Single Phase Voltage Stabilizer for Corporate Offices. Our product range also comprises of Control Panels, Electrical Control Panels and VFD Control Panel. Being a pioneer in the business, we are occupied with giving our customers a subjective scope of Single Phase Voltage Stabilizer. Our voltage stabilizers are accompanies voltmeter with selector switch, which serves to see data & yield voltages. The offered voltage stabilizers are utilized to secure the electric apparatuses, for example, AC, TV and Refrigerators from vacillations. Additionally, our significant customers can profit these voltage stabilizers from us at focused rates inside of a keep time.